As an Avalanche Forecaster I work in a snowy environment where I am able to explore a variety of questions related to avalanches, weather, and snow. Outside of work my colleague Charles Rubin (CWU Geosciences) and I explore some of these questions and occasionally find answers. We had our paper Glide avalanche response to an extreme rain-on-snow event, Snoqualmie Pass, WA published in the Journal of Glaciology this month. I’m sure you’re asking “What is an extreme rain-on-snow event “, “what is a glide avalanche response?”, or “when will summer actually begin?” Well, before I answer these questions let me provide a little background information. Dr. Rubin, he prefers Charlie, and I have been working together on avalanche related issues for the past eight years. Much of this work is done in my spare time, kind of like a hobby. OK, full disclosure- I am a snow geek, nobody does research in their spare time as a hobby unless they are a complete geek. Anyway, now that we’ve cleared that up let’s get back to the research. Charlie and I have been studying a glide avalanche slope near Snoqualmie Pass. Glide avalanches occur when the entire snowpack slides as a cohesive mass, right to the ground. These events are rare in their distribution and are difficult to predict when they will release. During our research we’ve managed to record a few events, provide data for some of Charlie’s graduate students, and stay interested enough to continue with the work. During January of 2009 a large storm was forecasted to affect Washington State. This was going to be one of those Pineapple Express storms with lots of rain and flooding due to high snow levels. Charlie and I figured the rain would trigger a glide avalanche due to the warming and water flowing through the snow pack. We were ready to record the event using the various sensors that were in place. I was also ready for the normal snow avalanches that might affect I-90. Rain often triggers avalanches within minutes of the first rainfall. Our avalanche crews performed a full round of avalanche control prior to the arrival of the rain to keep any rain triggered slides to a minimum. Our expectations were met when the rain arrived and we observed only small slides or sluffs that didn’t reach the highway due to our preemptive avalanche work. The rain fell throughout the day and into the night at a heavy rate, sometimes as much as .45” an hour. It looked like everything was going to be fine. The snowpack was absorbing most of the rain probably because the snow had been so cold and dry up through early January. Here’s where it gets tricky, don’t let down your guard. Just when it all seemed ok, it wasn’t. A large flow of water, slush, ice, rocks, and trees hit the highway in the area of a stream/avalanche path. Our Maintenance crews quickly cleaned up the area, but new problems were popping up everywhere. The water had finally made its way through the snow and the flood was on. The highway turned to a river. Interestingly, the glide avalanche slope wasn’t doing much. By the following day we assumed the worst was over. Water was flowing freely through the snowpack and lowland flooding was now the big concern. 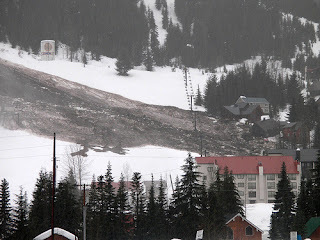 Wrong again as a massive landslide consisting of rocks, mud, woody debris, and snow let loose at the Hyak Ski Area. This slide took out a chairlift and a couple of houses. Still no glide avalanche though. The rain began to let up and by mid afternoon we had almost given up on the glide avalanche when it finally occurred. Even though the rain had affected the snow surface (usual onset of snow avalanches), then penetrated the snow to lubricate the base of the snowpack (typical trigger for glide avalanches) we didn’t see a glide avalanche. When the rain begins to let up we generally assume the snow is stabilizing and we won’t see any more avalanches, but we did. Charlie and I assume it took so long to happen because the snow pack prior to the rain was cold and dry. It took some time for the snow to settle and become a large cohesive mass, something we feel is necessary for glide avalanching to happen. Once the snow began to settle we saw the glide rates increase. It’s worth noting that normal avalanches happen quite quickly, while glide avalanches are often slow to develop. Our snow study plot on Snoqualmie Pass recorded a 3 foot decrease in the snow pack during the rain event. People often assume the snow is melted by the rain during these storms, but it takes a lot of energy (heat) to do that and there generally isn’t that much in a rain storm. What happens is most of the snow compacts and settles, which is good for stabilizing avalanche conditions, but not for the glide avalanche. I’m glad we don’t have many of these glide avalanches to deal with. After the storm Charlie and I assessed our data and put together a paper describing the event. We presented the results at the International Snow Science Workshop in Davos, Switzerland. It was quite an honor to go there and speak to snow geeks from all over the world. We were encouraged to expand our report and submit it for publication in the Journal of Glaciology, and after revisions and peer reviews we were accepted and published. We plan to continue our research during the coming winters, and who knows maybe someday I’ll find the time and money to get a master’s degree of my own. Hopefully this article sums up the paper, but just in case you want to read the full account (pdf). At least you now know what a rain-on-snow event can do and what a glide avalanche is. As for the third question, summer technically began on June 21, but we here in the Pacific Northwest know better. According to some forecasters summer really begins on July 12. Whenever it arrives remember to enjoy a little, it will be gone before you know it. This entry was posted on Monday, June 27, 2011 at 2:31 PM and is filed under avalanche, avalanche control, glide avalanche, snoqualmie pass. You can follow any responses to this entry through the RSS 2.0. You can leave a response.